We met up with some friends for dinner at Livery the other night. I was happy to see that there wasn’t a really long wait to get a table, as there was the last few times I went, but then again that was a long time ago. I still wish they took reservations though. 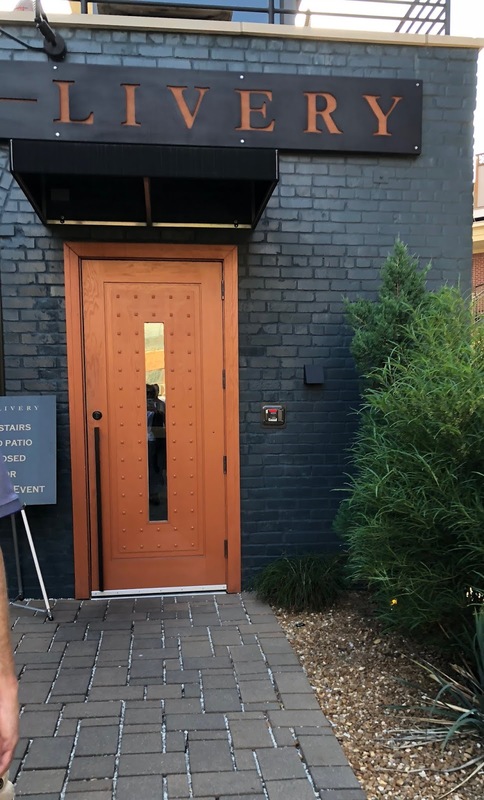 I feel like once these kinds of places get past the initial excitement upon opening, they would only do themselves a favor by taking them, rather than making people worry they won’t get it, and just not go at all. Just my thoughts. Anyway, I love those little spicy wagon wheel dealies you get for free when you sit down—I just wish they gave you a few more. There were six of us and we had to ask for more than one little cup of them. They’re made of puffed wheat that is fried, and then seasoned with a Latin seasoning salt. 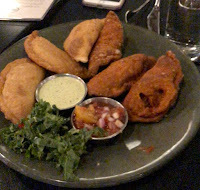 We then ordered a bunch of starters—the sweet corn ($5 or $6 off the cob); the ceviche ($11), the Brussels sprouts ($7) and corn and chorizo empanadas ($9 for three empanadas). That corn was amazing. So much so that we ended up getting three plates of it. And while I am sure it is delicious on the cob, it was a nice way to share with a group when you could just scoop some off. Love the hunk of jalapeno butter and chipotle mayo on there. 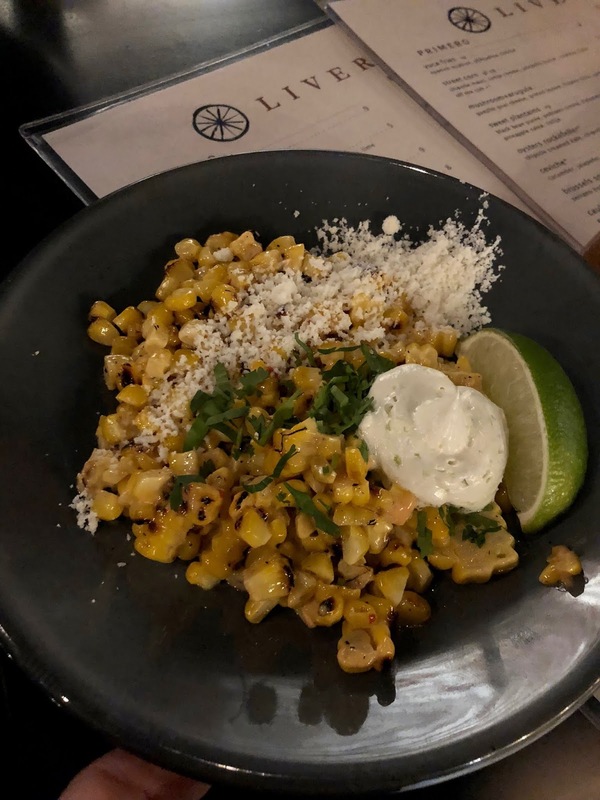 This corn was rich and decadent and had so much flavor. I would surely get this dish each and every time if it is on the menu. 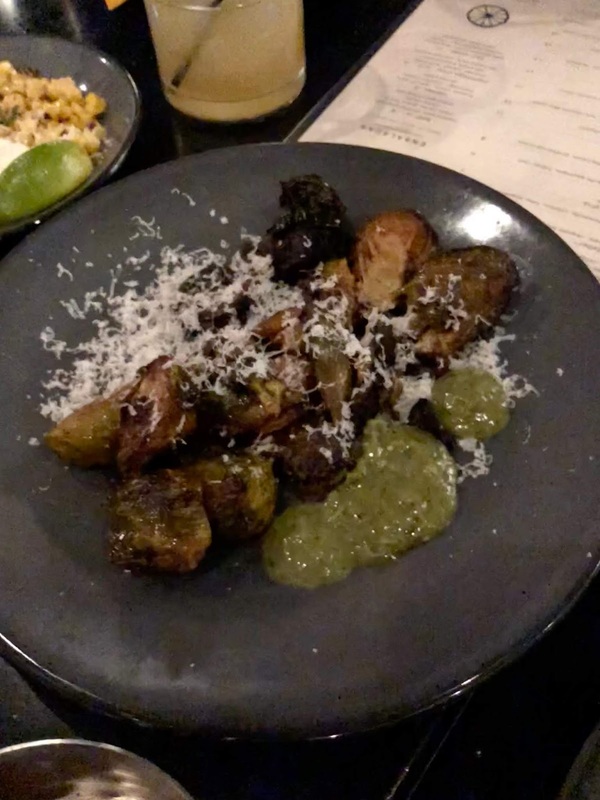 The Brussels sprouts were also quite tasty—roasted and topped with some cheese and served alongside a green salsa. I have had several of the various empanada choices, and these were good. I preferred the corn version to the chorizo ones. The chorizo empanadas came with a peach salsa, which wasn’t my favorite. The corn empanadas came with a cilantro crema and had cheddar cheese inside as well. They just had more flavor and even with the sweetness of the corn, came across as more savory. In the past, I have enjoyed the chicken version as well. 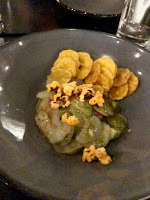 I really enjoyed the variation of the acidity of the ceviche. It was a nice contrast to everything else. It seemed like it was mainly made with shrimp and scallops. It was flavored with jalapeno, cilantro, tomatillo and lime. They serve it with super thin plantain chips, which were nice to eat with some of the seafood on it. There’s also some seasoned popcorn on top. I could take or leave the popcorn, just because when it gets a little wet, I find popcorn to get too seedy. I was quite happy with all of the appetizers and could happily just make a meal out of them in the future, but we also ordered mains. I ordered the pork belly tacos, because I was having a hard time making up my mind. 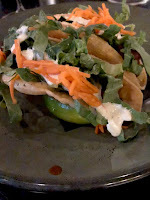 They fry up some flour shells and put a big slice of pork belly, along with black bean puree, chipotle BBQ sauce, lettuce, poblano crema, and pickled carrot. They were served with a lime wedge each. These were tasty, even though one of them had a fair amount of fat in the pork belly that made it a little chewy, therefore making it a little tough to eat. The other taco (which was of course the one I shared) was much better. The squeeze of lime was key. 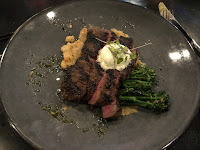 Hubby had the skirt steak ($18) with chimichurri refried beans, broccolini, and jalapeno butter. He really enjoyed it—the steak was cooked just right, nicely medium rare and tender. I just got a couple of bites but liked the ones I had. The only other dinner that I tried was one friend who had an appetizer for her dinner—the sweet plantains ($8) with black bean puree, poblano crema, habanero guajillo sauce, pineapple salsa and cotija cheese. I wouldn’t have probably ordered this, thinking it would be too sweet, but it was super tasty. The plantains with the heat and acid from the pineapple and habanero sauce, as well as the richness of the beans, cream, and cheese. It was really good. I would definitely be tempted to order this one again. I think this is the best meal I have had at Livery. I feel like they definitely have their groove going now and have adjusted menu items to keep making them better. I still haven’t been brave enough to try a salad here again, based on past experiences, but maybe one of these days. Anyone had a salad here that they really like? Or what have your overall experiences been? Feel free to update me!